Should I Replace My Missing Tooth with an Implant or a Dental Bridge? Even if you’re just missing a single tooth, it’s important that you fill in that gap in order to protect your oral health. Besides, no one wants to live with the social stigma of a gappy smile. You might have heard a lot about dental implants; many dentists recommend them as the best way to replace a missing tooth. However, they aren’t your only option; a traditional dental bridge in Jacksonville is also a viable choice for many folks. Let’s take a moment to compare these two options. 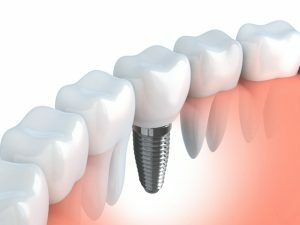 A dental implant is a small titanium post that an oral surgeon places in your jawbone. It serves as the support for a crown that will replace the visible portion of the missing tooth. A traditional dental bridge, on the other hand, doesn’t affect anything below the gum line. Rather, it consists of two crowns, which are placed over the teeth that are adjacent to the gap in your smile. A pontic (artificial tooth) is suspended between the crowns. One reason why many people prefer dental implants in Jacksonville rather than a bridge is because an implant will not affect the structure of the adjacent teeth. With a bridge, it is necessary for the dentist to file down the enamel on those teeth so the crowns fit properly over them. In some cases, such as if those teeth are suffering from decay, prepping and crowning them may be a practical step. However, most people prefer to keep those pearly whites untouched. Another factor to consider is bone health. An implant forms a bond with your body and actually serves as a replacement tooth root; it can therefore help to prevent bone loss in the jaw. A traditional dental bridge lacks this advantage. There’s no doubt about it — the upfront costs for a dental implant are significantly more than that of a bridge. However, it’s wise to consider the long-term financial impact of each choice. A dental implant has the potential to last for the rest of your life if you care for it well. A bridge may need to be replaced every 10 to 15 years or so. A porcelain bridge can look beautiful and blend in seamlessly with the rest of your smile. Similarly, a dental implant restoration can also provide you with a natural-looking new tooth. The key to making either option look good is to choose high-end materials and to team up with a skilled prosthodontist who can design your artificial pearly white so that it fits in perfectly with the teeth around it. Still don’t know whether an implant or a bridge is the right choice for you? Your dentist in Jacksonville would be happy to discuss each option with you and help you decide on the one that best fits your circumstances. Dr. Richard Aguila is a skilled periodontist who enjoys helping patients regain their smiles through dental implants. If you would like to talk to him about your desire to replace your missing teeth, please contact our office at 904-683-4781. Comments Off on Should I Replace My Missing Tooth with an Implant or a Dental Bridge?